For details on minor releases since FishEye 2.2, see the FishEye Changelog. FishEye 2.2 is focused on improved user experience, adding a powerful side-by-side diff visualization, along with improved quick-navigation, quick-search and performance enhancements. Thank you for your interest in FishEye 2.2. Download FishEye 2.2 now. See the documentation on Upgrading to this version. 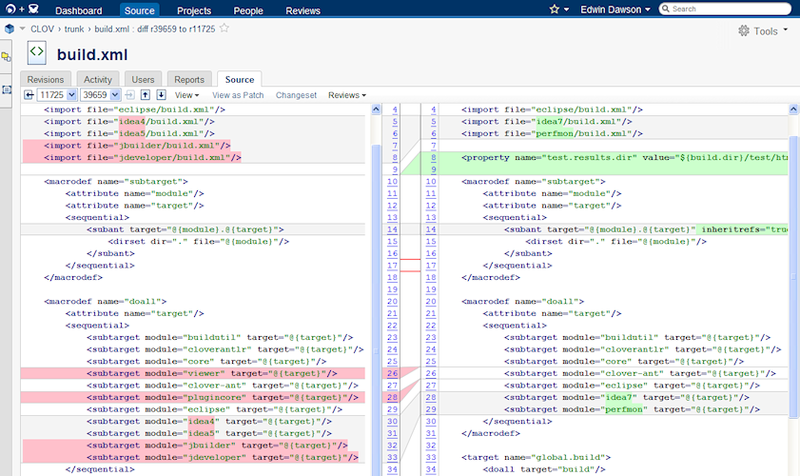 FishEye 2.1 adds improvements for the side by side diff view mode, which displays a powerful visualization of how code has changed between revisions. Two independently scrolling windows allow you to see new and old content clearly delineated, with explicit dynamic markings that anchor each change to its exact location in the left and right windows. FishEye's Quick Nav has been re-written to display results faster, and to return more relevant results. 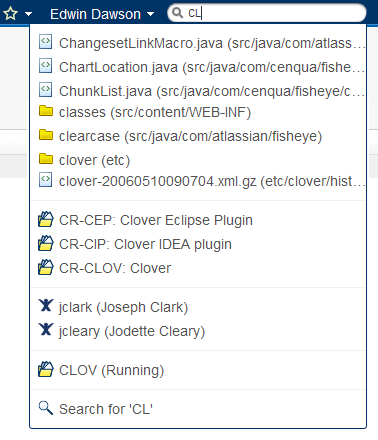 It still supports powerful IDE-like functions such as camelcase detection, multiple directory selection and cross-repository results. All these items appear in a handy preview window, when you type text into the search box. In FishEye, you can now drill down into the history of any line of code in a file. By hovering your mouse cursor next to the revision number in the left column, you can open the annotation context menu. From there, you can view the changeset where this file was changed, the diff of this line with the last change, or the full file from the time when this line changed. This speeds investigation of how certain lines have changed, when, and by whom. FishEye now lets you neatly copy and paste multiple lines of code directly from FishEye to the system clipboard, by dragging in the FishEye window to select. Previously, some other information would also be copied from the browser display. Now, only the code itself is copied for your convenience. FishEye's support for IBM ClearCase and Git has been in public beta for a number of months, but with the release of FishEye 2.2 it's now officially final. Having benefited from a good dose of spit and polish by our developers, these features are now fully supported and ready for production use. See the FishEye Git documentation for more details.